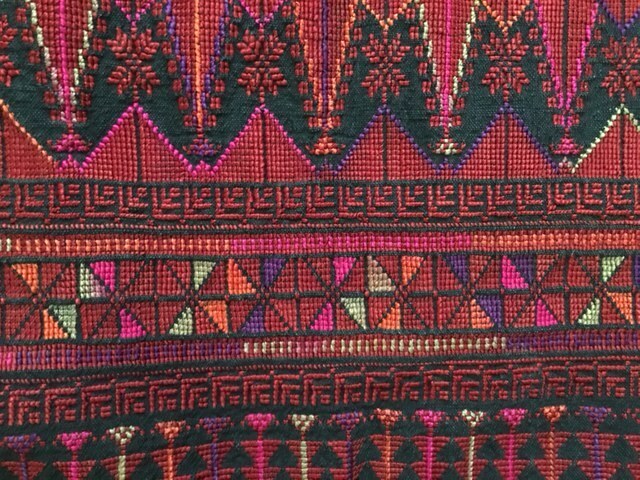 On Sunday, April 15, 2018, Northern California collector Betsy Rich-Gilon will present Threading Peace: The Embroidered Costumes of Palestine at the Alameda Free Library in Alameda, CA. The presentation will be in the library’s Stafford room from 2pm to 4pm. Rich-Gilon has been collecting dresses for many years under the tutelage of Widad Kawar, an internationally renowned collector of Jordanian and Palestinian ethnic and cultural arts seeking to preserve a culture that has been largely dispersed by conflict. Kawar, who is in her 80s and lives in Amman, Jordan, has encouraged Rich-Gilon to carry on with her own research and collecting and asked her to bring the stories of Palestinian women to U.S. audiences. At the April 15 event, Rich-Gilon will present her unique collection of costumes, some from as early as circa 1900, and tell the remarkable stories revealed in their colors and patterns about the women who made them. Attendees are encouraged to bring their own embroidered dresses from Palestine and the greater Middle East region with accompanying stories to share. The presentation is the third in a three-part Palestinian culture series at the Alameda Free Library this year. The first two were Bay Area documentary photographer Najib Joe Hakim’s beautiful and compelling multimedia storytelling project “Home Away from Home: Little Palestine by the Bay” (www.facebook.com/HomeFalastin/) and a reading by local author Joy Totah Hilden from her book A Passion for Learning: The Life Journey of Khalil Totah, a Palestinian Quaker Educator and Activist, a biography of her father’s fascinating life as an educator and activist on behalf of Palestinians as partition was debated at the United Nations. For more on the photo exhibit, which is still on display, click here. The series is cosponsored by Friends of Wadi Foquin and the Arab Cultural and Community Center of San Francisco. Download a flyer for the April 15 event.